IMAN’s expanding Behavioral Health work offers culturally competent services including individual, couples and group counseling. 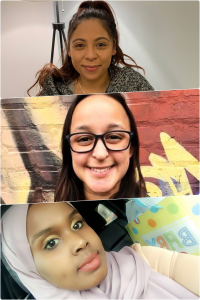 Faduma Sheikh-Abdi, Sandra Galicia, and Laura Caballero make up the dynamic team of graduate-level interns who have played a key role in helping increase community access to therapy. We sat down with them to learn more about their stories, experiences working with visitors to IMAN’s Community Health Center, and plans for future careers in the behavioral health field. Faduma: I was born in a refugee camp in Kenya after my family was forced to migrate from their indigenous home in Somalia due to civil war and famine. I was raised in Minneapolis, and moved to Chicago when I was 13. I grew a profound passion for intergenerational trauma after recognizing how I have internalized my family’s pain, which led me to enroll in the Clinical Mental Health program at Northeastern Illinois University. Laura: I’m from San Antonio, TX and have been living in Chicago for 3 years now. I’m currently in my second year at the University of Chicago’s School of Social Service Administration. I’ll be graduating with a Master’s in Social Work this June. Sandra: I am proudly from Gage Park, and am currently in my second and final year of graduate study at UIC’s Jane Addams College of Social Work. Other interests of mine include urban agriculture and food accessibility. What are your career goals/aspirations? What inspired you to pursue a future in Mental Health/Social Service? L: After graduation, I hope to continue my work in community mental health. As a future therapist, I feel my services should be easily accessible so individuals and families feel confident in finding appropriate resources. I would like to eventually work at the intersection of law and mental health, supporting refugees and asylum seekers with trauma-informed services. S: I plan to help bring more accessible mental health services to Gage Park, and the larger South Side. I was inspired to do this work after my partner was killed in a drive-by shooting when I was 16 years old. Reflecting on the connection between tragedies like that, systemic inequalities and institutional violence, I have strived to live a very intentional life. I am committed to helping disrupt the violence that unjustly impacts my community. F: Not having a relationship with my sweet grandma [Ayayo]—who was diagnosed with Alzheimer’s Disease—created within me a burning desire to foster healing for anyone who is in need of help. I value sincere connections with elders, and am pursuing a career in mental health to help community members feel heard and validated. Share an experience you’ve had thus far at IMAN that embodies “Health, Wellness & Healing”. S: I don’t think I’ll ever forget the circle [gathering] we had after the Jason Van Dyke verdict. Staff, leaders and residents came together to share our thoughts and feelings after that emotionally charged day. While the cause for the circle was devastating, I feel that the circle itself embodied “Health, Wellness, & Healing.” I am lucky to have shared that space with folks. F: Phenom, a talented IMAN artist and inspirational speaker, blew my mind during an Arts & Culture workshop. I felt everyone in that space tap into one powerful force of love and unity. There was no hierarchy, no judgment, just flowing energy and laughter. L: The circle session after the Van Dyke trial. It was powerful to see IMAN come together to heal during a moment of great pain. The Behavioral Health team facilitated reflection to help everyone process their feelings and emotions. It was a beautiful moment of support I’ve never seen in a workplace. This entry was posted in Direct Services, News by IMAN Staff. Bookmark the permalink.